I recall that I was in the plaza that you all call Revolution, where big loudspeakers transmitted to mute, hungry and above all deaf people your verbal diarrhea. That was Thursday March 15, 1990, Stalinist Europe was falling, the old Soviet empire was at the point of disintegrating and here in the Caribbean a senile caste was clinging to power and refusing to implement reforms. We express our most firm and unconditional support to our brothers of the Patriotic Union of Cuba (UNPACU) who, in the east of the country are struggling between life and death on a hunger strike. We hold the regime and its political police publicly responsible for the consequences for their lives and health that may result from the just demand for our arbitrarily imprisoned brother. We send to each and every one of the strikers and the members and officers of the iconic and courageous organization, the Patriotic Union of Cuba (UNPACU), headed by well-known opposition leader José Daniel Ferrer García, our deepest sympathy and affection. Those of us present took the opportunity to publicly call world attention to the unfortunate cases of Nicolás Felipe González Menéndez and Arcelio López Rojas, in the prisons of Villa Clara and Camagüey respectively, who may lose their lives in hunger strikes they are engaged in separately and for different reasons. The cases of Nicholas and Arcelio are paradoxical and for us the silence and indifference of the media, as well as a few activists in and out of Cuba, is unacceptable; for the simple reason of not being recognized as political prisoners, they are denied coverage and following in the media. Those who are listening to us know that we are here today for each and every one of the prisoners in Cuba, whether or not they have the status of political prisoners, whatever the causes for which they were imprisoned, they have the right and solidarity with them. And whoever lacks the courage to do it, let them know that today we met here in Saratoga, and open and responsibly we speak up for all those in Cuba and elsewhere in the world who risk their lives in the just demand of their rights. Although we will miss the commemoration of Mother’s Day, we want to congratulate in advance Cuban women as mother, wife and woman. And especially in these moments they have been at the forefront of the vanguard and fight in the Cuban resistance, confronting with courage and patriotism the totalitarian repression. This time we want to congratulate several Cuban Marianas these days who are carrying the truth of Cuba to different parts of the world and international forums such as: Berta Soler, Yoanis Sánchez, Belkis Cantillo, Laura Labrada Pollán, for all of them on behalf of Cuba, many congratulations. Those meeting here today and gathered here on this public balcony in view of Camagüey and the military are here confirming our sacred commitment to the peaceful defense of human rights and democratic change, and especially in unity in action, as a basic component in all liberating process. Those gathered here in Saratoga, members of the following organizations: Camagüey Human Rights Unit, Pedro Luis Boitel National Civic Resistance Movement, Rosa Parks Women’s Movement for Civil Rights, members of the Central Opposition Coalition, all affiliated to the Orlando Zapata Tamayo National Front of Civic Resistance. We also want to emphasize the presence of Yris Tamara Pérez Aguilera on a convalescent bed recovering from pain of a beating and the fear that we have because there may be a repressive action and we may be suppressed. Also here are the opposition activist and mother of Santos Fernández Sánchez, Elida Sanchez Jimenez. In February 2008, the United States government granted me a special humanitarian visa for my consequent admission into Jackson Memorial Hospital in Miami in order to treat my severe cardiovascular infection which I still have. Because I put as a condition real guarantees of returning as soon as I finished the examinations, and not accepting the humiliating condition of permanent exit from the country, the political police denied me the famous exit permit. Friend who follows me on Twitter, it still has not occurred to me to reactivate my passport, foreseeing the little Castro-communist game. But if I ask myself, in the case of seeking it, will the tyranny permit me to leave to go to the hospital and then return, knowing that I will neither shut up nor leave? Camarioca, in the ’60’s. Mariel in the ’80’s. The rafter crisis in 1994. And now, the migratory reformers: the escape valves continue, the strategies continue, the bleeding of our nation by the Castro-communist tyranny continues. Alert, compatriots. Alert, compatriots. This can be a little game of incalculable and dire consequences for our nation. Today is the 27th of November 2012 and after having sung the notes of the National Hymn a group of Cuban resistance members, militants from different organizations of the peaceful opposition, are here in the city of Placetas on the roof top of the home headquarters and we are and are going to give a reading in the voice of Sara Marta Fonseca Quevedo of a joint statement of various organizations about themes of the Cuban resistance. Many opposition organizations gathered in the city of Placetas this November 27, 2012, in order to draft and make known this joint statement in which they express their commitment and collaboration, as well as their reciprocal loyalty in moments in which the regime through its political police becomes embroiled in a dirty and pre-meditated campaign to bleed the vital forces of the Cuban resistance, specifically those who have contributed most to that important breach and earned areas of freedom. The Cuban Party for Human Rights affiliated with the Andrei Sakharov Foundation, the Rosa Parks Women’s Movement for Civil Rights, the House of the Prisoner Ernesto Diaz Madruga, the Mario Manuel de la Pena Movement for Human Rights, the Cuban Association of Free Yorubas, the Pedro Luis Boitel National Civil Resistance Movement, want to let emerge in an open and responsible way our resolute decision to respond with unity, commitment and activism to the despicable effort to remove the internal resistance from the streets and public spaces in order to return them to their homes and enclosed places. Those present here, all promoters of civil disobedience as a fighting strategy, want to make quite clear our unconditional support for any civilian project that may be put into practice, emphasizing our priority of those initiatives that further international repercussion and other media impacts that may promote change, from the citizen, from the actual phases and taking into account the potential factors for democratic change. Long live the internal resistance! Viva! 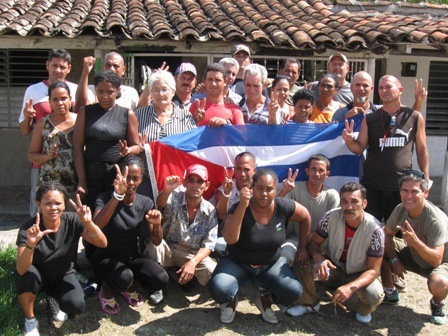 Long live the Cuban Party for Human Rights affiliated with the Andrei Sakharov Foundation! Viva! Long live the Pedro Luis Boite National Civil Resistance Movement! Viva! Long live the Rosa Parks Women’s Movement for Civil Rights! Viva! Long live the Front! Viva! Long live free Cuba! Viva! The streets are of the people! Attention, attention, we are informing you that before undertaking this activity military troops armed with bladed weapons have just entered the children’s circle located next to my home, the Golden Age, there is stupor, there is fear, there are several relatives that have approached this circle to take their children and we are blaming the communist Castro tyranny in the person of Raul Jazares, chief of the political police for the psychological damage that the sight of those firearms may cause to those little children. We want to highlight that we dedicated today’s celebration to the honor of the eight medical students who one day like today were killed by the cowardly bullets of the Spanish colonialists. Yesterday the dissident Cuban writer Luis Felipe Rojas Rosabel, author of the blog “Crossing the Barbed Wire,” left the Holguin city of San German for the land of the free. Today, therefore, is a very sad day both for the opposition as well as for independent journalists and the Cuban blogosphere, because the teacher of teachers has left, a complete authority on discourse and recommendations for writers and bloggers, and above all a true specialist on sending multimedia via cellphones. Rojas Rosabel was the first journalist to whom I granted an interview in April of 2007 after I got out of prison. We owe him a lot: expert in sending Twitters and multimedia, exemplary patriot, religious Cuban and sensible guajiro. Rojas Rosabel leaves a big hole in his party, extremely difficult to fill, but a pleasant memory and the most positive of impressions. In his native San German, the repressive forces took the opportunity to try to fabricate a dissident intellectual from a left-leaning and extreme moderate to counteract Luis Felipe and his important work, a move that struck at the dignity and firmness of purpose of our brother whom we are sure that, from the land of the free, will continue as a leader, teacher, fighter and committed patriot and above all a source of pride for all of us who had the honor to meet his and share with him in the struggle. 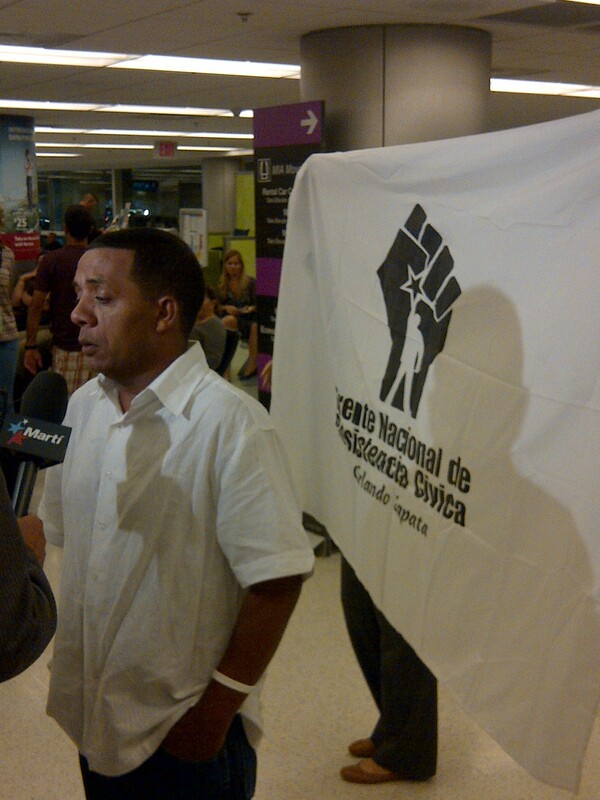 One more Cuban who is forced to leave his homeland, to protect his existence and that of his family. One more friend who left and whom I don’t know if I will ever see again. One more reason to continue fighting, proud of the chosen path. When men like Luis Felipe Rojas Rosabel exist, despite the difficulties and geographic distance, we are convinced that the freedom of Cuba may be delayed, but it is certain, very certain. Points of the declaration from Virginia. The signatories below, members of a countless number of organizations which make up the Central Opposition Coalition, an entity affiliated with the Orlando Zapata Tamayo National Front of Civic Resistance, have gathered this Wednesday, 3rd of October 2012, in the already historic and war-hardened neighborhood of Virginia, in Santa Clara, where we will write down in a public declaration of principles the following aspects and commitments. 1- Today those who sign and seal this declaration support the initiative named “Civic Demand for Another Cuba”. – At the same time, all and each of those present ratify the viable character of the program “Towards a National Stoppage” as a continuity and colophon to the campaign of No Cooperation in its first and second stages. As promoters of the same, we make clear that with the campaign “Towards a National Stoppage” we initially make a call to take consciousness on the side of the Cuban population of the necessity to create conditions that permit, with the participation of all Cubans, a gradual stoppage of economic, political and social structures and mainly the repressive ones of the Castro Communism. 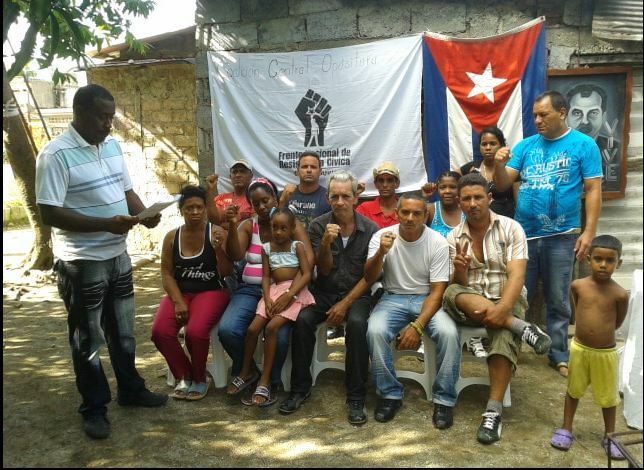 3- Those making this declaration declaration today in the Neighborhood of Virginia see with consent and patriotic pridethe birth and positive development of Homes of the Prisoner in Cuba, genuine expression of the maturity of the unanimity of a nation that they try to divide based on absurd categorizations. 4- At times when the forces of domestic resistance suffer like never before from the repressive onslaught of the tyranny, we request solidarity from the international community. From our hard reality we pray so that the people of Venezuela rescue again the destiny of this brother nation and with it the future and stability of our hemisphere. 5- The Central Opposition Coalition and the National Front of Civic Resistance Orlando Zapata Tamayo, ratifies its executive structure in Cuba, as well as to ratify the Assembly of Cuban Resistance as our representative outside Cuba. Rolando García Casa de Vals, Yanisbel Valido Pérez, Arturo Conde Zamora, Yris Tamara Pérez Aguilera, Alcides Rivera Rodríguez, Carlos Michael Morales Rodríguez, Alexei Sotolongo Díaz, Rolando Ferrer Espinosa, Leticia Ramos Herrería quien se encuentra arrestada intentando llegar, Alberto Reyes Morales, Miuchel Oliva López, Xiomara Martín Jiménez, Mayra Conyedo García, Onelia Alfonso Hernández, Idania Yanez Contreras, Aramilda Contreras Rodríguez, Damaris Moyas Portieles, Jorge Luis García Pérez Antunez,Santa González Pedroso, arrested trying to arrive, Julio Columbie Batista, arrested trying to arrive, Irael Pérez Díaz, arrested trying to arrive, our brothers Ricardo Pupo Sierra and his brave troop in Cienfuegos who are detained in their own houses and beacuse of safety reasons a high number of brothers who in this moments are either arrested, are being arrested or simply detained in their own houses. Among the present organizations are found Resistance Movement, Rosa Parks Women Movement, Nationalist Party of Cuba, The Home of the Prisoner, among others, all the organizations ratify their unconditional permanence, eternal and faithful to the Coalition of Central Opposition and we recognize our leader Idania Yánez Contreras as figurewho most gathers us together with most important, serious, genuine leadership of the opposition in the center of the country. Long Live the Coalition of Central Opposition.